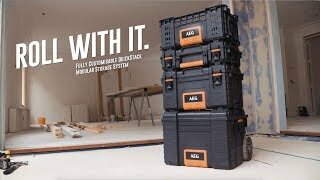 The 3-piece AEG Quickstack modular storage system is the ultimate in worksite transport and storage solutions. Featuring a customisable 6-tub organiser on top, a generous 22” toolbox with a convenient, removable inner tray, and the ultimate, all-terrain mobile storage cart. Made out of an impact-resistant resin material, it offers protection against the heaviest bumps and knocks on site. The IP55 rated weather seal, found on each unit, offers protection against water damage and debris. The 3-piece set also includes a locking bar that can be used to lock and secure multiple pieces together, for security and peace of mind on site.